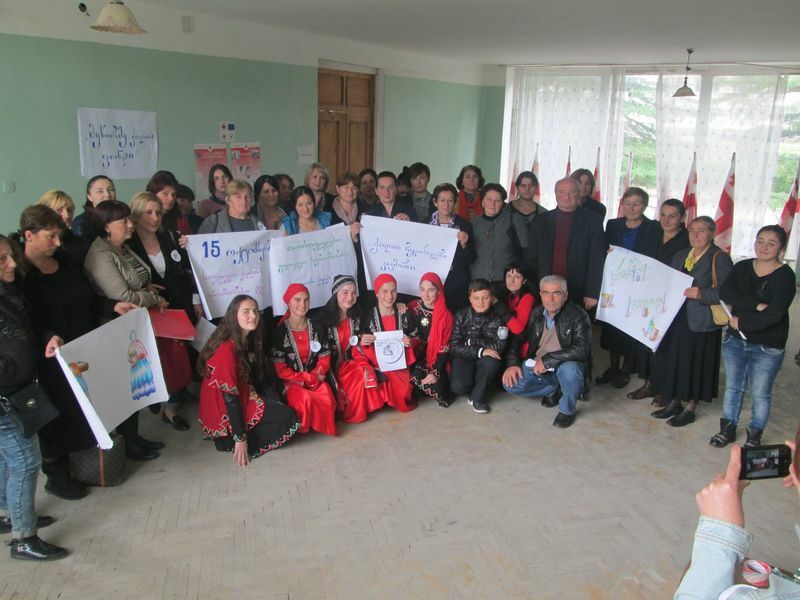 On October 15, 2015 in Lechkhumi, in Tsageri Municipality Gamgeoba, took place the “Round table” dedicated to the International day of rural women on a subject: “Results of survey-questionnaire on women needs and problems” (in lower Tsageri, Chkhuteli and Gveso) . At a meeting there were 38 people, among them, representatives of local government: Chakvetadze Carlo, deputy governor of Tsageri Municipality; Svanidze Kakha, the deputy on agriculture development issues; Kopaliani Marika, deputy on IDP’s issues; Kurashvili Bakar, chairman of Tsageri Sakrebulo ; Liparteliani Temur, the chief specialist of Tsageri Sakrebulo on agriculture development issues; Nino Burjaliani, Head of statistical service of Tsageri municipality; Joni Khaliani, head of a social service; Kopaliani Eka and Museliani Tsotne, representatives of information center Racha-Lechkhumi and Zemo Svaneti; Lartsuliani David, director of Tsageri Public School; Urtmanidze Diana and Khetsuriani Bondo, representatives of the Ministry of Agriculture; the non-governmental organizations operating in Tsageri: “Regional union of Lechkhumi Women”, “International organization of democracy and fair elections”, “Center of the rights and gender equality”; active women from Tsageri and three villages of Lechkhumi: lower Tsageri, Chkhuteli and Gveso (28 women). The international day of rural women (International Day of Rural Women) is celebrated annually, on October 15. 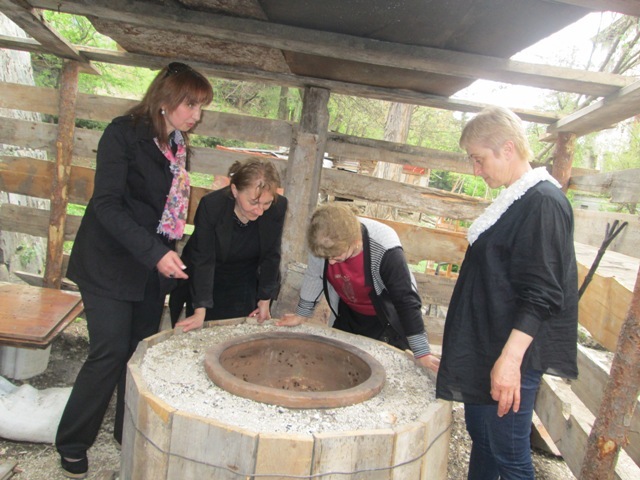 “The fund of women entrepreneurs” reminded society, work of these women how expensive and valuable are ,that rural women play a key role in preservation of stabilization of agriculture. There was presentation on results of survey-questionnaire, then – discussion in which women of the region and the invited guests took part. Zaza Chachava _ representative of the Abkhazian government in Imereti. The purpose of the “round table” was to discuss the issues identified as a result of meetings with project representatives of government agencies. 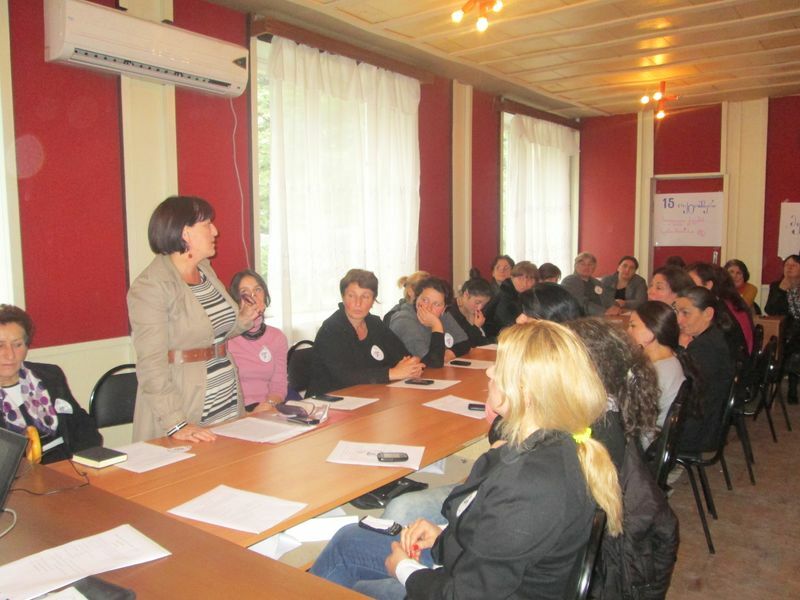 On April 29, 2014 a roundtable on the topic “More Motivation –More Employment Opportunities” held within the framework of the project “Reinforcing the position of IDP women living in Borjomi region through their involvement in small business” was organized by the Fund of Women Entrepreneurs with the support of the Civic Association “GLEN SLOVAKIA” working in Bratislava , Slovakia. 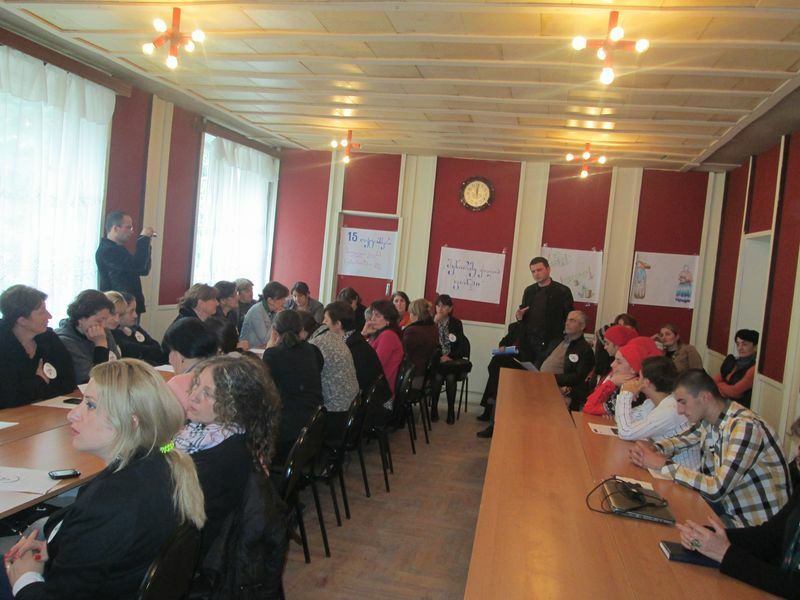 Members of Borjomi Municipality, women entrepreneurs and beneficiaries of the organization attended the meeting. 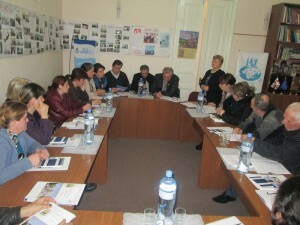 Lack of funds as one of the obstacles for the development of small business, was discussed at the meeting. 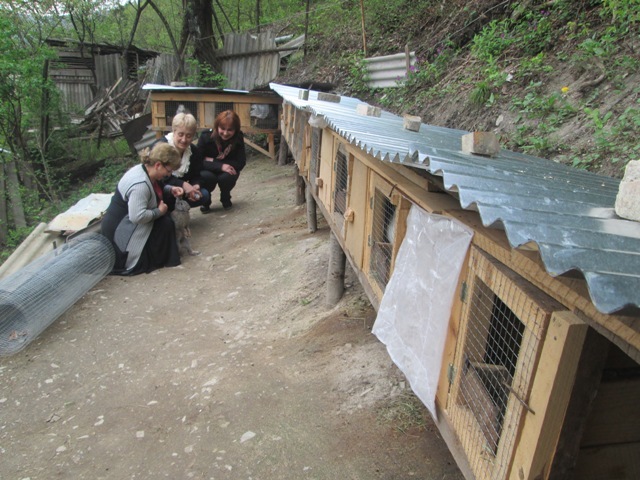 Beneficiaries from Kutaisi gave some advice and shared their experience with the beginner entrepreneurs in Borjomi to run their business successfully. 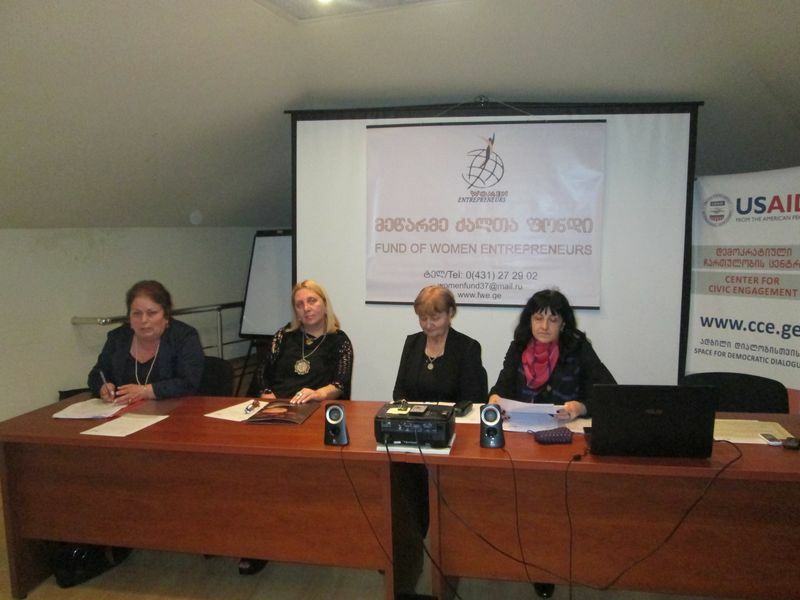 On December 10, 2013 Fund of Women Entrepreneurs held a roundtable meeting on the topic “We condemn violence”. 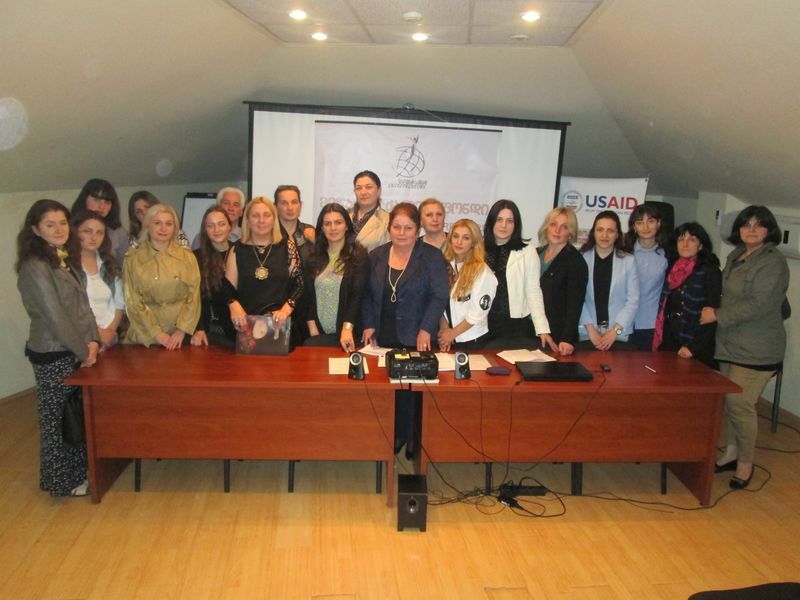 All the activities implemented by the fund in the framework of the international campaign “16 Days of Activism Against Gender Violence” were summarized at the meeting. Employees and beneficiaries of the fund, acting advocates, and representatives of NGOs discussed about the amendments to be considered in the law of Georgia on “Prevention of Domestic Violence, Protection and Prevention and Assistance of Victims of Domestic Violence” and about their legal and prevention ways. They concluded that domestic violence has a complex character and governmental and non-governmental actors and civil societies’ union and media effort is essential. 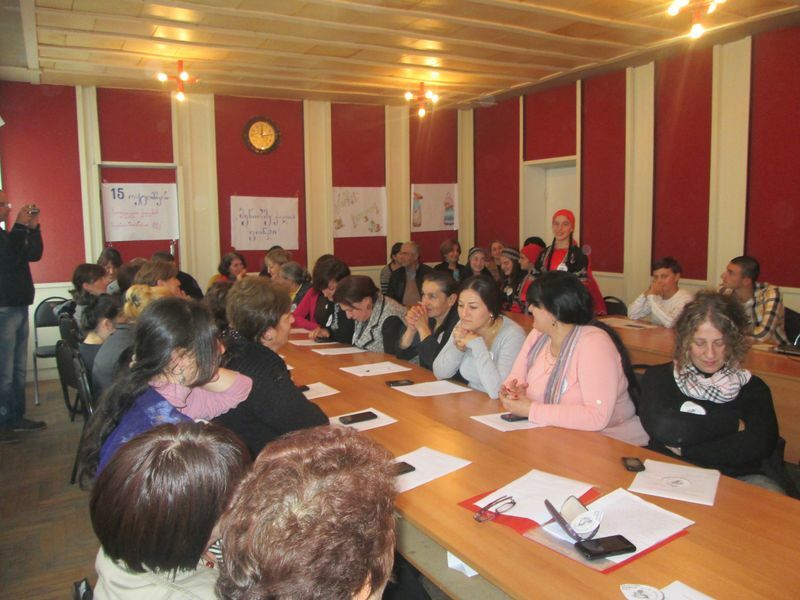 On December 10, 2012 Fund of Women Entrepreneurs held a Roundtable “Violence and women’s rights”. The meeting was devoted to sum up the work done by FWE, within the international “16-day campaign against women violence’’. At the meeting employees of the organisation, beneficiaries, representatives from the Mayor’s Social Service Center, Akaki Tsereteli State University, Kutaisi public college “Iberia”, association “Peaceful and Business Caucasus”, Government of Abkhazia and also representatives of “Young Lawyers Association ” discussed about the forms of violence, its social, economic, legal factors and ways of prevention. At the Round-table debates they emphasized that “violence is evil” that must be reduced with the help publication and profound knowledge. 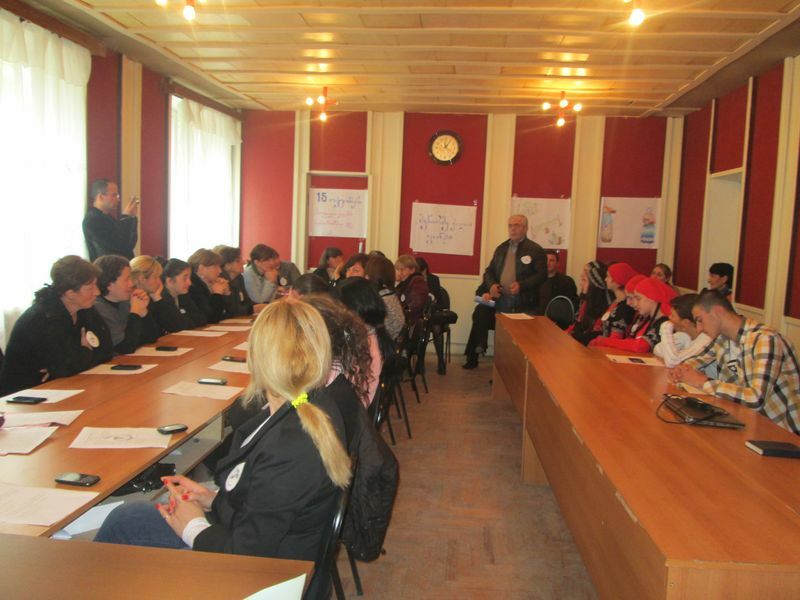 On November 28, 2012 a roundtable was held in Kutaisi, hotel “Bagrati 1003” on topic “Gender Equality and Women’s Political Empowerment”. The organizers of the meeting were International Foundation for Electoral System (IFES) and Manana Mebuke – a head of Gender Equality Network. 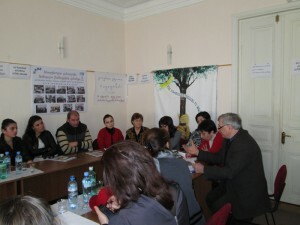 The meeting was attended by the first vice-speaker of the Parliament of Georgia, Chiora Taqtaqishvili, Rusudan Kervalishvili – MP in previous parliament, a project manager Nermin Nishichi, Suzan Khauli, a chief manager of Democracy and Governance office of the United States Agency for International Development (USAID), social society and media representatives. 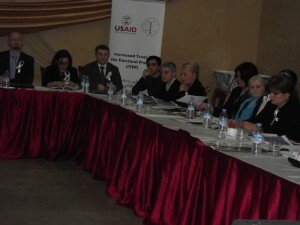 Fund of Women Entrepreneurs as the member of the network also took part at the meeting. 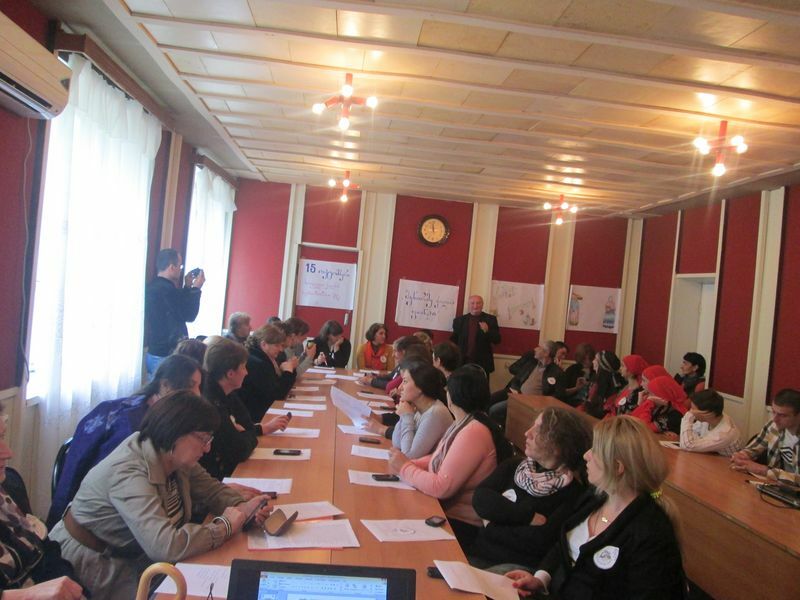 The main object of the meeting was eliminating negative stereotypes, imbalance and wrong attitudes in society, connected to the strengthening women politically. On June 21, 2012 at the Center for Civic Engagement, Fund of Women Entrepreneurs held a Roundtable – Presentation: “Choose a profession – become a leader.” Fund’s staff briefed the audience with the current project in the following areas: courses of professional orientation for young women, the school for middle-aged women, advocacy and lobbying issues. 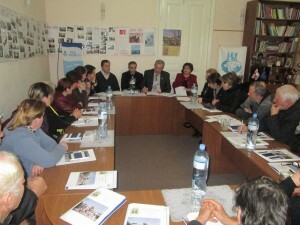 The meeting was attended by representatives of different institutions: the nongovernmental sector, the Mayor’s Office and City Council of Kutaisi, the Information Center of State Administrative School of Zhvania, the public colleges – “Iberia” (Kutaisi) and “Phazisi” (Poti), direct beneficiaries of the project – young women and women of middle age. The meeting further strengthened the possibility of cooperation with governmental and nongovernmental agencies.